The purpose of a salad dressing is to enhance the flavor of the ingredients within. It is not meant to drown the salad or overpower it. Many times, salad dressing is overused and can increase the calories of a meal significantly. The key to using salad dressing is to pick the right kind and to keep your portions controlled. There are two basic types of dressings: those that are oil based (vinaigrette) and those that are creamy based, typically made with mayonnaise, sour cream, yogurt, or buttermilk. Dressings can be flavored using a variety of ingredients, including different types of vinegar, herbs, shallots, onions, spices, mustard, and sugar. The calories and fat content will vary greatly in store-bought salad dressings. Aim to keep your portion to about one serving or two tablespoons of salad dressing. 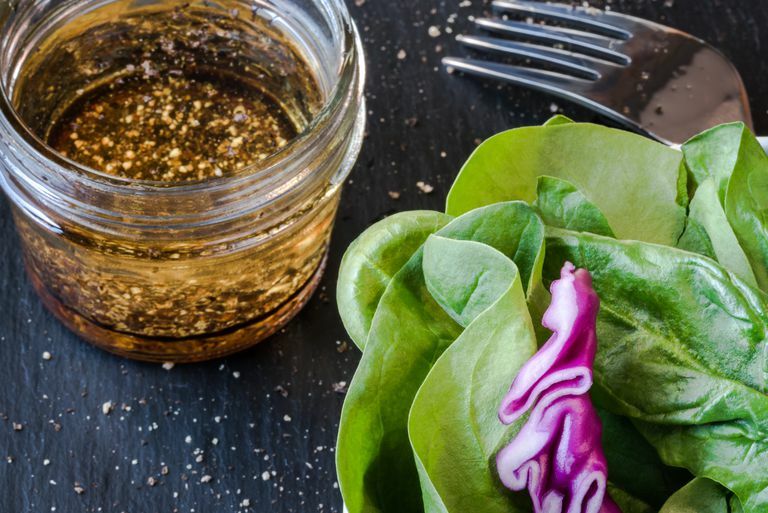 This particular salad dressing, balsamic vinaigrette, is lower in calories than other varieties, containing about 60 in one serving. Note that it is high in sodium. When looking for salad dressing look for those with the lowest amount of sodium. Aim for about 250mg or less of sodium per serving. Typically the healthiest salad dressings are those that are oil-based because these types of dressings are made with heart-healthy fats such as olive oil, nut oils, and canola oil. However, because the standard ratio to making a vinaigrette is three parts oil to one part vinegar, even the healthiest salad dressings are high in calories. Therefore, it is important to keep your serving to one portion. When possible, make your own dressing so that you can control the fat, calories, and sodium. If you are making your dressing at home you can reduce the sodium content significantly by flavoring it with lemon, a small amount of orange juice, or some apple cider vinegar. You can also add garlic, scallions, or shallots to add flavor and reduce the oil content so that the calories are lower. When making your own dressing, be sure to whisk it just before use to make sure the ingredients are emulsified together. If you are simply dressing one portion of salad, aim to keep your oil to a teaspoon or two and mix it with your favorite type of vinegar. You can also reduce the calories spent on dressing by purchasing those dressings that have spritzer tops. Or dip your salad into your portion of dressing instead of pouring the dressing over your salad to lower your calorie intake. Of the store bought salad dressings, some of the lower calorie ones that are oil-based are those that are labeled light. Typically, these types of dressing will have water as the first ingredient. They include light balsamic and light Italian. Always read the labels, though, because these types of dressing may have more sodium and sugar. Avoid those that have high fructose corn syrup. Instead, you are better off choosing a full-fat version and reducing your portion. Other best choices include Balsamic Vinaigrette, Italian, Red Wine Vinaigrette, Apple Cider Vinaigrette, and Herbed Vinaigrette. The unhealthiest salad dressings are those that are made with added sugar, sour cream, mayonnaise, and egg yolks. These types of dressing are rich in calories, added sugar, and saturated fat. They can easily be overconsumed and can often sabotage a healthy meal. A few of the unhealthiest salad dressings include Creamy Caesar, Creamy Italian, Ranch, and Russian dressing. For example, as compared to a balsamic vinaigrette, two tablespoons of store-bought Creamy Caesar dressing contains 170 calories and 18 grams of fat, as compared to 90 calories and 9 grams of fat. Look for salad dressing that has no more than about 100 calories (preferably less) in a single two tablespoon serving. This is roughly the same amount of calories in two teaspoons of oil. You also want to find a salad dressing that has the lowest sodium content. Store bought salad dressing can be high in sodium because it needs to last long on the shelf. Aim to purchase dressing that has 250 mg or less of sodium (this can be hard to find so search for the lowest one you can find). In addition, purchase salad dressings that are oil based. Look at the ingredient list and choose those that are made with oil, such as vegetable oil or extra virgin olive oil. If the ingredients have added fats such as egg yolks, cream, or cheese, the dressing is probably very high in calories. It isn't necessary to purchase no sugar added dressing. While this type of dressing may have the least amount of calories and carbohydrate, it is often replaced with artificial sugar and artificial flavorings and doesn't offer the heart-healthy fats used to make other types of oil-based dressing. We need some fat in order to absorb fat-soluble vitamins. In addition, heart-healthy fats such as olive oil can aid in satiety and have favorable effects on cholesterol. Instead, to reduce calorie consumption, reduce the quantity of the vinaigrette you use to dress your salad. It is also not necessary to purchase non-fat or lower fat dressing, as these types of dressing typically have more sugar and sodium—the makers are trying to replace the flavor lost from the fat and make up for it somewhere else. Use salad dressing sparingly to marinate chicken, turkey, or pork. Or dress your salad lightly with an oil-based dressing, dip vegetables into a small serving or substitute mayonnaise, butter, and creamy sauces for dressing on whole grain sandwiches and salads like tuna or chicken. You can save on calories and saturated fat this way. Be mindful of your serving and if you need more flavor, add extra vinegar, such as apple cider, balsamic, or white wine. Spring Mix Looks Healthy... But Is It? Can You Include Ground Beef in a Healthy Diet?